Bigfoot: Chasing Shadows is rated 3.4 out of 5 by 18. Rated 5 out of 5 by Birkies from Fun little game When I get to the end of a demo, its either ohoh :((, or ahh :)) meaning I'm glad its over. I only buy if its ohoh. So I bought this one while it was a good sale. Lasted longer than I expected. Fun and engaging puzzles. Gotta be exact clicking on hidden objects! The ending.....oooh, a hint of truth? Rated 5 out of 5 by FORTUNATUS from BIGfoot, a fun LITTLE game.... ;} I played this game early on when I first joined up with BFG and remember truly enjoying this game quite a bit despite my initial skepticism.... don't expect anything extremely challenging yet do look forward to a very pleasant and fun 'casual' game. Please note: I'm bumping it up a bit #one star or so# with my rating because I think it deserves much more than it's been credited overall... Absolutely worth a DD!!!! 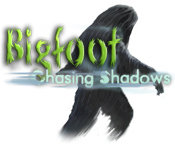 Rated 5 out of 5 by rainbowtree from Bigfoot: Chasing Shadows Engaging storyline. Reasonably sized and well hidden objects match scenes, with new items subtly appearing. No timer to detract from gameplay. Excellent minigames. Includes extras like informative articles, webcam of a bigfoot sighting, and concept art. Sparkles give a bit too much guidance. Rated 4 out of 5 by Haberyan from Bigfoot: Chasing Shadows... or chasing conspiracies? I got this game in 2010 when it first came out. Played it as a kid with my mom and sister, so I didn't fully understand what was going on half the time, haha. Regardless, this is a great game and I'm glad I revisited it! Pros: -Primarily HOP scenes and not the traditional pick up item, use item format in more recent games. -TONS of variety in puzzles with only a few repeats, spread evenly throughout the gameplay. Very enjoyable, try to complete them without skipping! Some can be a bit difficult. -Built-in extras... and it's not a collector's edition! The Bigfoot facts were very interesting, as well as the little webcam clip at the end. -Love the use of color and light in the areas! Cons: -Of course, this game's a bit dated since it came out nine years ago. Graphics are fairly pixelated, and some of the HOP scenes can be a bit repetitive. -Some of the objects are very hard to find, and they're scattered across multiple areas. There's often no indication of if you've found all the items in an area or not, so that can be confusing. -A bit short. This does have a fair length to it, but once you get to the real bit of plot towards the end, it goes very quickly. -Very little story. Definitely not a creepy game like it might seem to be. More of a mystery story. Still, the variety in gameplay made up for the short story. Try to buy this game with a coupon code or a credit. It's a wonderful little game that you can spend an hour or two on. Definite buy for me! Rated 4 out of 5 by Hookedonbigfish from Bigfoot... Why Why was this game entitled any thing to do with Bigfoot. The game had virtually very little to do with the mythical creature and any reference to the legend was finalised fairly early in the game. What the game was all about was the unveiling of shady actions relating to a chemical company's illegal dumping of waste materials and clandestine production of a secret elixir. The dialogue and voice overs were adequate enough to keep you abreast of the unfolding adventure and the graphics were colourful clear with plenty of detail. The puzzles and mini games were varied, with jig saw type games, maze games match 3 and loads more, all of which were reasonably easy to solve. 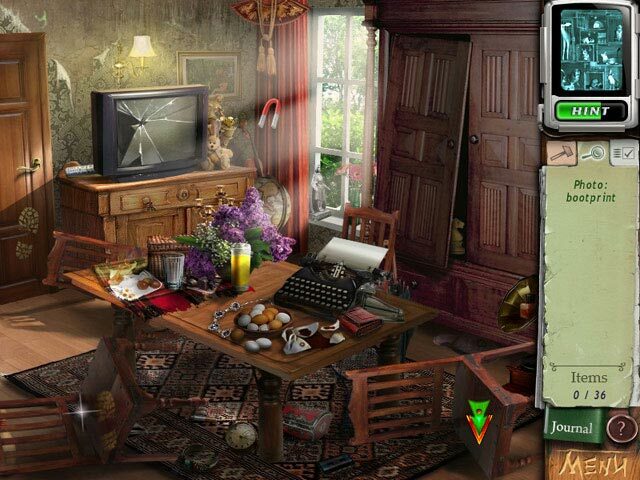 The hidden objects were a little more challenging as they were found in up to three locations for each stanza and you had to switch back and forth constantly as the items on the list were revealed. Some were also very well hidden. 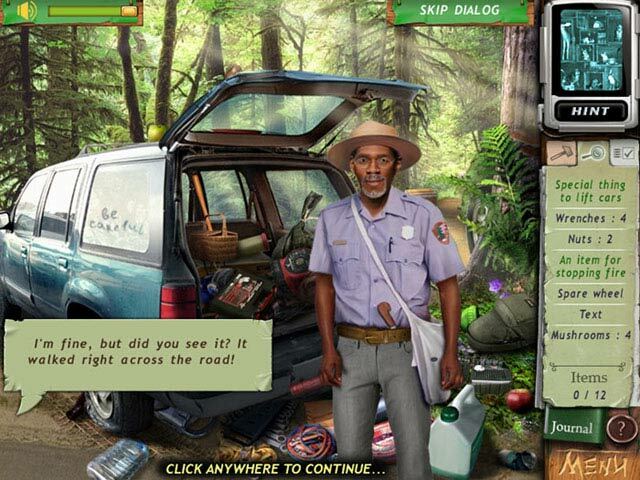 This game is for staunch hidden object buffs but had precious little to do with Bigfoot. It was still quite a reasonable game, I liked it. Rated 4 out of 5 by SeaBamboo from Bit too much hand-holding but a fun game The prologue is funny; watch the subtitles underneath the newcaster . There are voiceovers & I thought they suited the characters; some of the dialogue can be clicked through if you wish. The graphics are clean & bright; the artwork is really nice, the music could be better but I liked the background noises. The screens are a little slow to load but not really a problem. There was a black band down each side of my widescreen. This is a straight Hidden Object but not just lists; you have to find objects from both a list & from silhouettes & keep an eye out for arrows to go to another scene as you have to move around to find them. Some of the objects can be very small so I had to do a bit of squinting. The mini games are fun & weren't too difficult to solve. There are sparkles for objects of interest & rather a lot of hand holding in regard to objectives. The hint button recharges in around 1 minute. As you go through the game you unlock Top Secret pages which give you the usual information about Bigfoot; later you can also unlock some of the Art Concepts which were an added bonus. Rated 4 out of 5 by petergee from Bigfoot - chasing a solution This is a fun game but seemed a little short somehow - I was slightly disappointed at the ending...it seemed it was rushed at the end - maybe more in a sequel but then how can they call that bigfoot 2? Play the game to see why! Graphics are good enough, challenges are just good enough to hold your attention but somehow it left me feeling it was missing something. It's a good game but not a great game! Rated 3 out of 5 by dealuvs from Difficulty? There was more emphasis on difficulty (got to be able to somewhat "see" the items to find them!) rather than adventure. Hunt after hunt, not enough adventure, developers were more interested in seeing how hard they could make it to see an item. That's great for those who want to just seek and find but not so much for impaired sight or adventure seeking. Didn't finish, not even close, so I cannot comment on story although I wish I could learn about the facts. Rated 3 out of 5 by pennmom36 from Bigfoot: Legend Or Hoax? A recent slew of Bigfoot sightings has people wondering if a chemical plant is responsible for a Bigfoot hoax to divert attention away from the bad publicity the company is besieged with. You are a reporter assigned to cover this report in your hometown, and you have seen Bigfoot as well! 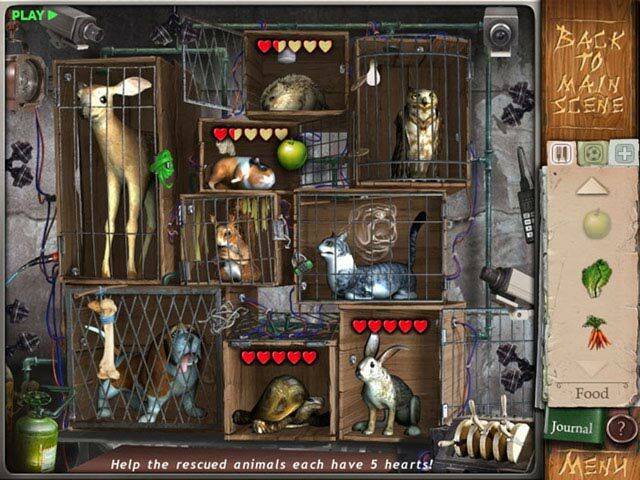 This game has a very interesting story but I just couldn't get into the hidden object scenes. You travel to different areas looking for equipment that you will need and gathering stupid items such as fruit and flower pots. Some items are list finds, some silhouetted shapes and some actual pictures. Some of the items are used in your inventory as tools in order to accomplish a given goal. At times I was at a loss as to what to do next which rarely happens. There are simple mini games such as putting together pieces of a torn up map. In my opinion if the game would have stuck to pertinent items to search for Bigfoot instead of mundane tasks, this would be an excellent game. Perhaps it improves as the game progresses but I didn't finish the demo because it just wasn't exciting enough. Uncover the truth as Linda goes in search of a legend and winds up fighting for her very survival in this seek-and-find mystery!